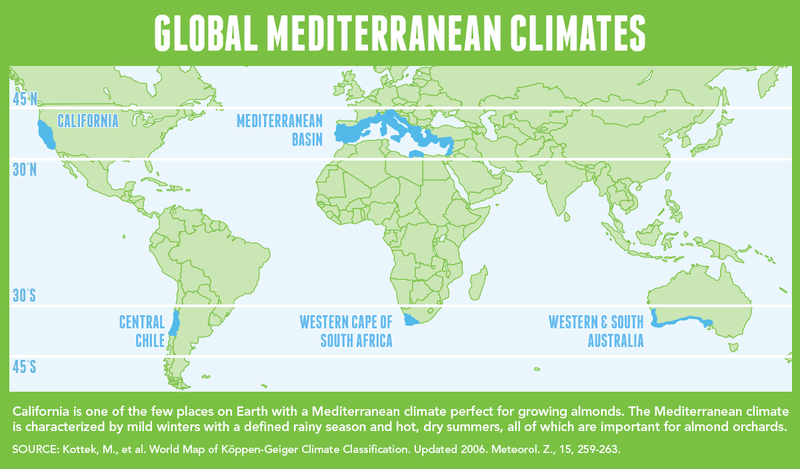 California is one of the few places on earth with the Mediterranean climate needed to grow almonds. Others with suitable climates include the area around the Mediterranean Sea, Australia, South Africa and Chile. Ideal climate is a major reason the state produces more than 80%1 of the world’s almond supply. But California is also unique in other ways, including its rich soils, natural resources and infrastructure, and innovative research and technology. In addition to following federal regulations protecting workers, food safety and the environment, California farmers must also abide by stringent standards set by the state that further protect people and the planet. 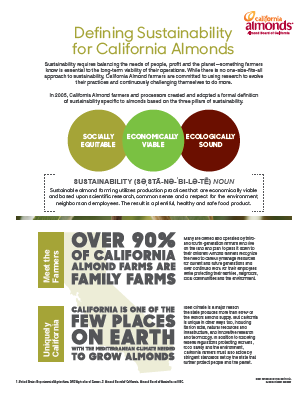 All of these things together make California the most productive almond-growing region in the world. What’s more, California grows 400 different crops and produces more than 50% of the nation's fruits, nuts and vegetables. An acre of almond trees grows 450 pounds of protein, 260 pounds of fibre and “good” monounsaturated fats, which helps keep almond lovers energised and satisfied.2,3 In addition to the significant human health benefits, almond orchards grow environmental benefits, too. What’s more, almond trees also grow co-products—the hulls, shells and woody tree material—that bring additional value to the California Almond community and the local environment while contributing to zero waste and addressing needs across food, pharmaceuticals, automotive and more. 1. Almond Board of California, Almond Board of Australia and INC.
2. USDA-ARS, NDL. USDA National Nutrient Database for Standard Reference, Release 28. Version Current: September 2015, slightly revised May 2016. 3. Alissa Kendall, et al. Life Cycle–Based Assessment of Energy Use and Greenhouse Gas Emissions in Almond Production. Part 1: Analytical Framework and Baseline Results. Journal of Industrial Ecology. 2015. 4. David J. Nowak, et al. “Tree and Forest Effects on Air Quality and Human Health in the United States.” Environmental Pollution. 193: 119-129. May 2014.